When you’re camping, finding a plug can be troublesome. So the more ways you can help yourself by converting to solar power, the better off you are. Of course, many campsites, like the powered ones at Broken Head Holiday Park, offer an opportunity to charge your devices or set up lights easily around camp. But if you’re out on hike, the likelihood of locating power is pretty much next to none. This is why solar power can be your best friend. Basics like lights, recharging and more, are great ways to get started converting over to solar power. Check out our blog post, “5 Reasons Why Solar Power is Your Friend When Camping,” for tips to get started. This time we’re listing a few versions of solar powered camp stoves. That’s right! You can literally take your stove with you on a hike (in some cases) and serve up a hot snack or even a meal without worrying about tracking down a picnic area with a BBQ. Weighing less than 3.5 kg, the GoSun Solar Camp Stove is easy to set up and as long as there’s sun, you can cook food in any season. It doesn’t need to be a not-a-cloud-in-the-sky day, just a bit of sunshine will work with this solar camp stove. This cool camping stove allows you to cook a meal in 20 minutes by using solar energy. Using compound parabolic reflectors onto the centre tube, the cooking chamber converts the sunlight into heat, reaching up to 280°C. You just load your food into the tube that is vacuum sealed, set your timer and wait for it cook. The GoSun Sport costs $321. A more affordable solar oven, Sunflair folds down to the size of a seat cushion according to the website. Combine that with a less than 1 kg weight makes it perfect for your camping needs. The deluxe kit includes two silicone pots, each of which allows the temperature to reach up to about 282º C.
Temperatures will depend on location and time of year, but it does work for “four seasons below 40′ degrees latitude and three-season above. A UV index of 4+ is best for solar cooking.” The Sunflair costs anywhere from $89 to $164. In addition to these features, the Sun Oven has a visible thermometer so you can keep track of how warm your oven is at all, and the insulation is made to keep constant temperatures. Plus, the reflectors fold down easily so you can store the Sun Oven. This oven retails for $699 and is large enough to make food for your entire family or large group. Larger than the Sport, GoSun Grill can bake, boil, roast, fry or steam food for eight people. The grill will need to be preheated before use, but even an overcast sky should be able to give you enough sunlight to create a heated chamber that is ready to cook. Keep in mind, even once the chamber is ready, larger dishes will need at least partial sun to keep cooking. Heats up to high enough temperatures that you can even roast a turkey or chicken in it! Also, if you want to grill in the evening, then look towards the end of this year for the solar electric hybrid panel accessory, which connects to a lithium iron battery to store solar energy. Retails for $900. 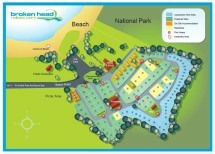 At Broken Head Holiday Park we welcome campers who wish to get away from everything, including the use of electricity to do everything in their lives. Check out our nonpowered sites and start dreaming of your off-the-grid, relaxing holiday getting away from it all!